In the summer, coaches and media agreed Eight-Man, Division I had little separation between the top teams. The regular season and especially the sub-state championship games reinforced the notion in a strong, parity-driven year for the classification. “In eight-man football, anything can happen – and it will,” St. Paul coach Keith Wiatrak said. In the west, Atwood, St. Francis and Hoxie went 1-1 against each other in District 8 with all three matchups decided by 16 points or fewer. Hoxie lost to St. Francis, which fell at Spearville in the first round of the postseason. In the quarterfinals, Spearville beat Central Plains on the game’s final offensive play, and Hoxie needed a late comeback to beat South Central by five. The Indians defeated the Lancers on the road, 44-20, last Friday. In the east, Burlingame, West Elk and St. Paul finished 1-1 against each other. Victoria fell at Osborne by six in districts. St. Paul delivered a massive comeback to beat Osborne, 35-24, in the quarterfinals. Last week, St. Paul responded with another comeback and a second straight upset in a 43-34 home victory against Burlingame. Wiatrak said the Bearcats were “unbelievable talent-wise” with depth and physicality, especially with senior linemen Tristan Lee and Jake Thompson. However, several off-the-field factors and some personnel/scheme adjustments tilted in St. Paul’s favor. “Nobody thought we could do it,” Wiatrak said. 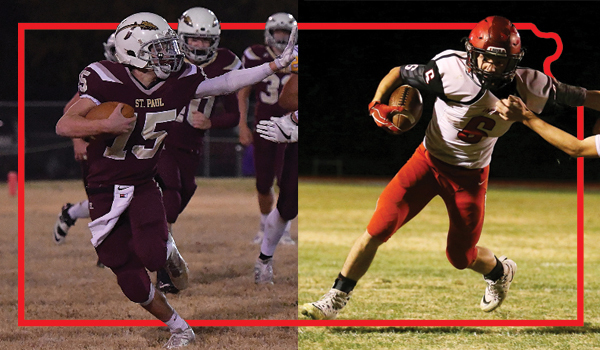 Now, Hoxie and St. Paul, both 11-1, will face off in a surprising Eight-Man, Division I state title game. Start time is 11 a.m. on Saturday at Newton’s Fischer Field. Both teams were not ranked in the top-5 in the preseason. Hoxie, which has enjoyed a five-victory improvement from ’16, has eight straight winning seasons. The Indians are 0-2 all-time in state title games with runner-up finishes in ’78 and ’81. Hoxie has traditionally been very strong defensively under Baar. “It’s definitely something that not only I’ve wanted for several years here, and that’s always been the goal, but this community wants it bad,” Baar said. This season, Hoxie is the No. 1 scoring defense in the classification with just 8.6 points permitted a contest. The Indians had no seniors last year and feature significant size up front, especially with juniors Taye Washington (6-3, 335), Jarrod Dible (5-11, 195) and Colton Heskett (6-3, 180) and senior Luke Schippers (6-2, 190). Senior Chris Cox, a first-year transfer from Oakley, is 5-10, 233. Hoxie had a significant size advantage against Spearville and gave the Lancers its first home loss since Week 5 of 2013. The Indians held Spearville’s great single wing attack to just 5.1 yards per play and picked off two passes. The Lancers had just one interception entering sub-state. St. Paul is 3-3 all-time in state championships with wins in ’86, ’00 and ’02. Wiatrak, a former St. Paul quarterback and longtime assistant under Doug Tuck, has built back the Indians to an elite power, especially with the back-to-back upsets the last two weeks. Burlingame and St. Paul have a significant history in the last four years since Bearcat coach Jeff Slater and Wiatrak inherited their respective programs. Last fall, St. Paul lost, 58-12, against Burlingame in the quarterfinals. “I honestly think Burlingame came in a little bit like ‘We are going to hammer you guys and go to the state championship game and move on,’ and it was almost like they were overconfident,” Wiatrak said. The teams see each other every summer in the Southwestern College thud (no tackling) camp. “When us and Burlingame get matched up together, it becomes a tackle camp, and last year it was really physical,” Wiatrak said. In pregame last week, Wiatrak said St. Paul took notice of several Burlingame moments. The Bearcats mimicked St. Paul’s warmups. Wiatrak said Burlingame 6-foot-7 senior wide receiver Caiden Musick, a first-year transfer from Rossville, told St. Paul senior quarterback/defensive back Braven Born “I’ve already got my ring sized,” alluding to a state title. “I don’t think they respected us, and I think whenever you get into the playoffs, if you don’t respect a team that you are playing, it will come back to bite you,” Wiatrak said. Burlingame took a 34-20 lead late in the third quarter. In the fourth, Born found senior Caleb Pecha for a score that cut the deficit to 34-28. With under five minutes left, St. Paul tied the game on a 15-yard TD pass off 4th-and-12 from Born to sophomore Adam Albertini. Wiatrak put senior Brenden Doherty and Pecha on the same side to draw the double team. The duo ran a double slant, but St. Paul had no intention of throwing them the ball. Albertini went underneath on a drag route, strung it out to get open and got to the pylon for the score. “We were just kind of drawing it up in the dirt at that point, and it worked,” Wiatrak said. St. Paul’s defense, built on a “bend but don’t break” mantra, limited Burlingame to 59 plays for 323 yards (5.5 yards a play). Musick had just five catches for 41 yards and a score. He was a non-factor in the second half as Burlingame didn’t throw deep over the top. Born, nearly a foot shorter, guarded Musick 1-on-1 all contest. “We had a mindset that Burlingame is a big play team,” Wiatrak said. “They score a lot of points fast. If you keep them from the big play and make them get those five yards, OK get those five yards, get a first down and start over. Born scored from four yards out with 1:34 left for a 40-34 left, and foreign exchange student Alejandro Mate, for the second straight week, tacked on a late field goal for a two-possession game. St. Paul noticed Burlingame ran virtually all its running plays behind Lee and played its defense accordingly. “We stunted Lee’s ‘B’ gap just about every play,” Wiatrak said. The Indians noticed Lee was banged up in the fourth quarter and ran at him. When Thompson lined up on the inside shoulder of the Indians’ tight end, St. Paul audibled to a sweep. Additionally, St. Paul used a newly minted four wide receiver set. Born has thrown for more than 1,400 yards this season. Albertini has a team-high 975 rushing yards. His brother, senior Anthony Albertini, is one of eight-man’s top linemen. Albertini against Hoxie’s front will be one of the key title game matchups. St. Paul mainly plays nine offensively and eight defensively, while the Indians have depth, especially up front. Cox and Washington switch off at nose guard. Often, Washington will play the first two downs and Cox will come in on third down. Cox has 25 tackles for loss with 13 sacks, both team-highs. Heskett (23 TFLs), Dible (17.5) and Schippers (11.5) have put up big numbers. Hoxie was even in turnover margin last year and stands at plus-17 this year. Senior defensive back Troyal Burris and his twin, senior linebacker Taylor Burris, have both picked off seven passes. Like St. Paul with Mate, Hoxie is solid in the kicking game with Washington (25 touchbacks) and Troyal Burris (39 yards per punt, 13 of 23 inside opponents’ 20-yard line). Cox and senior Latham Schwarz, who leads the team with a significant margin with 231 carries for 1,518 yards and 31 rushing scores, have been bothered by ankle injuries. Both should be fine for Saturday. Cox has served as the fullback and lead blocker. Last week, Baar turned to Schwarz early and told the running back to expect a heavy workload. Schwarz, known for his highlight reel plays, logged 34 carries for 243 yards, both career-highs, and three TDs. Most notably, Schwarz had big runs in a huge regular season home district victory against Atwood and versus South Central. “I am getting ready to think, ‘What are we going to run next,’ and I look back up and there he goes, he is off for a touchdown,” Baar said.